Lean chicken breasts cook quickly and can be paired with all kinds of ingredients and flavors. Chicken breasts are an excellent protein to add to casseroles, and they make fantastic skillet meals. Add to your menu choices with this list, which includes many of our most popular recipes. Boneless chicken breasts are versatile, flavorful, and low in fat. And you can find chicken breasts in fresh and frozen individual portions, thinly sliced cutlets, and fully cooked casserole and salad-ready strips. It's no wonder they're so popular. Because they are so lean, chicken breasts can easily become dry if cooked too long. Some slow cooker recipes work well with chicken breasts, but some don't. We frequently use chicken thighs in slow cooker recipes calling for boneless chicken breasts, or a combination of chicken breasts and thighs. Here are some of the most popular boneless chicken breast recipes, including casserole recipes using chicken breasts, baked chicken breasts, skillet recipes, and more. Thin pounded or sliced chicken breast cutlets make this fried chicken fast and super easy. And they are delicious! This is a restaurant-style chicken Marsala recipe that is purportedly similar to the dish from Olive Garden. Use sweet or dry Marsala wine in the recipe. Chicken Marsala is flavorful and easy to prepare and cook in the skillet. Flattening the chicken means it will cook quickly and evenly. As another option, thinly sliced chicken breast cutlets are convenient and cut down on the preparation time. Serve this chicken dish with hot pasta or rice, along with a green salad or side vegetable. Purchased Alfredo sauce makes this chicken and zucchini skillet dish easy and convenient, and the combination of chicken, zucchini, and tomatoes is delicious. Feel free to use your own homemade Alfredo sauce or another cheese sauce you might prefer. A tasty tropical sauce highlights this easy, great tasting sweet and sour chicken dish. This chicken recipe is made in just minutes in the skillet, and you probably have most of the ingredients on hand. This easy chicken and mushroom dish is a simple combination of ingredients and seasonings. Condensed soup makes an easy sauce, or use the included instructions to make a homemade sauce. Thinly sliced chicken cutlets are deep fried to perfection to make fabulous fried chicken sandwiches. Use the spicy Sriracha mayonnaise on the sandwiches or your own favorite sandwich spread. Boneless chicken breasts are browned in the skillet and then baked with a barbecue sauce, bacon, and cheese topping. This easy chicken recipe is great with a potato salad and baked beans. This easy skillet chicken dijon recipe is perfect for when you need a quick everyday meal. The simple combination of chicken broth, wine, and mustard is flavored with dried basil and tarragon. Serve it over a rice pilaf or cauliflower rice. 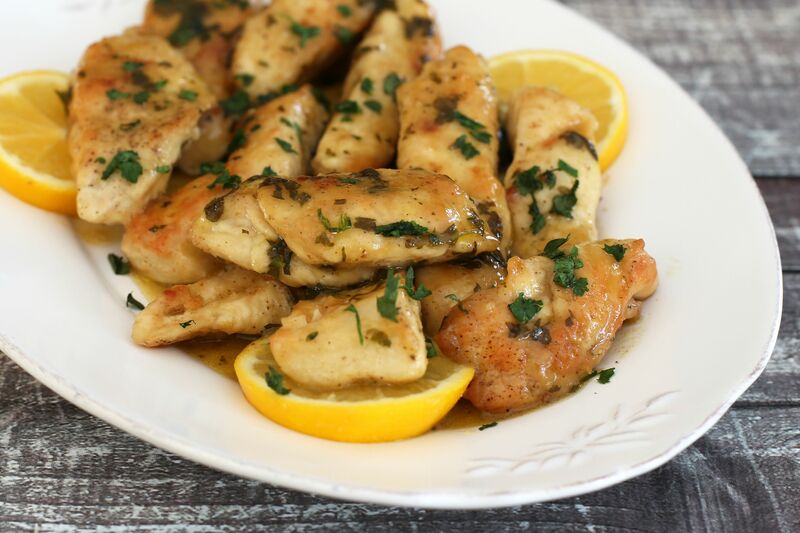 The classic combination of chicken and lemons will never go out of style. We usually add capers to this dish, but they are optional. Use chicken tenders, boneless chicken breasts, or strips. Grilled chicken is served with a spicy Cajun cream sauce, linguine, and fresh chopped green onions and tomatoes. Use an indoor or outdoor grill, broiler pan, or a stovetop grill pan to cook the chicken breasts in this recipe. These boneless chicken breasts are flavored with a tasty cilantro cream sauce. Red bell peppers and green onions add to the flavor and color in this easy dish. Mustard, mayonnaise, and a crispy panko crumb coating flavor this oven-fried chicken. Sliced zucchini is added to the sauteed chicken in this easy skillet dish. Simple cream cheese and garlic sauce completes the dish beautifully. Some heavy cream, lemon, and garlic makes this chicken dish a tasty and easy meal to make any day of the week. Frozen spinach souffle is used to make a delicious topping for these boneless chicken breasts. Your family will love this easy skillet chicken dish. The flavorful sauce is made with cream cheese and Parmesan cheese. Top it off with shaved or shredded fresh Parmesan and parsley for an extra-special look. Some heavy cream enriches this tasty Marsala sauce. The sauce is flavored with basil, green onions, and some lemon juice. This easy skillet chicken is made with thin pounded or sliced chicken breasts along with mozzarella cheese and bacon slices. Use precooked bacon for a quick and easy prep. This chicken dish is a quick and easy skillet dish. Serve the chicken and tasty tomato sauce with angel hair pasta or vermicelli. This easy skillet chicken takes just minutes to prepare and cook. Bacon and green onions flavor the chicken perfectly. The tasty sour cream sauce finishes this chicken dish perfectly. Fresh chives, parsley, and dill are combined with Boursin cheese to make this surprisingly easy sauce for the chicken. Seasoned stuffing crumbs are crushed or processed to make the coating for these simple oven fried chicken breasts. The chicken breasts are seasoned with spicy Cajun seasoning and refrigerated for about an hour before they're cooked. Your favorite chutney and some chopped green onions make a flavorful sauce for this easy skillet chicken dish. Serve the chicken with hot cooked rice or buttered noodles for a tasty family dinner. A balsamic vinegar marinade flavors these boneless chicken breasts. The chicken is grilled or broiled to perfection. Sweet cream of coconut and curry powder make a fabulous sauce for these boneless chicken breasts. Pineapple juice and a variety of spices and seasonings flavor these simple baked boneless chicken breasts. The chicken is browned with a flavorful coating and then it's baked with a sweetened pineapple juice sauce. These boneless chicken breasts are breaded with a simple seasoned flour mixture and then they're baked to perfection in a very hot oven. This easy skillet chicken and zucchini​ combination is finished with sliced or shredded mozzarella cheese. Your family will love this Parmesan cheese and herb-coated chicken. Serve it plain with vegetables and potatoes or rice or add a marinara sauce and melt some Mozzarella cheese over the chicken and serve it with spaghetti. Barbecue sauce, pineapple, and seasonings team up to make a delicious sauce for chicken breasts or tenders. An easy veloute sauce is the perfect finishing touch for these seasoned sauteed chicken breasts. This is an easy dinner to prepare, and you can keep it relatively low in fat with low-fat mozzarella or make it with less cheese. If you're short on time, use seasoned fine dry bread crumbs and some grated Parmesan for the coating. This easy, creamy chicken is wonderful over split buttered biscuits, or serve it on toast points, rice, or puff pastry shells. Grilled or broiled chicken breasts are made extra-special with a flavorful goat cheese sauce and an optional roasted red pepper puree. The goat cheese sauce is seasoned with parsley and garlic herb seasoning. Purchased pesto flavors oven fried chicken breasts perfectly. The chicken is coated with the pesto and then rolled in a panko and Parmesan coating. This popular chicken dish is an all-in-one casserole, perfect for a busy day. Pesto and some heavy cream make up the sauce for this super easy chicken dish. Or use your favorite homemade pesto combination. The cheese and ham stuffing help to keep the chicken moist in this slow cooker chicken recipe. Serve the chicken rolls over noodles, rice, or spaghetti. This popular chicken casserole is made with cooked diced chicken breasts. 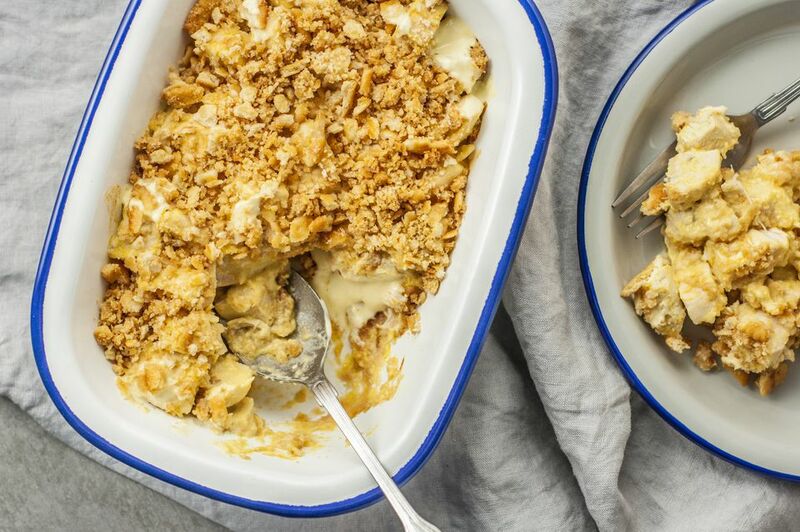 This casserole is destined to become a family favorite. This chicken divan is an easy casserole made with chicken breasts, broccoli, and cheddar cheese. Diced cooked chicken is used in the dish, and a simple white sauce with sour cream makes a smooth and creamy topping. This sauteed chicken is finished with a flavorful creamy havarti cheese sauce with garlic and optional dill. Chicken cutlets are used in this recipe. Or use pounded small chicken breast halves. Chicken and shrimp go together surprisingly well in this easy garlic chicken and shrimp skillet dish. Serve the chicken and shrimp over hot cooked pasta. These crunchy baked chicken strips are incredibly easy, and the flavor is amazing. The chicken can be served as an appetizer or as a main dish. Use chicken tenders or make this dish with cutlets. The Marsala sauce, tomatoes, and green onions give the chicken fabulous flavor. Chicken breasts are baked in foil packets with a walnut and bread crumb stuffing mixture. Serve the chicken with potatoes or rice. The filling for this pie is made with boneless chicken breast halves and a variety of vegetables. This savory slow-cooked crock pot Swiss chicken casserole is made with only 5 ingredients. herb-seasoned stuffing crumbs and Swiss cheese flavor the dish and make it a hearty meal.